Permanent Secretariat of the CGT Catalonia for September 11 , 2013. All people were born to be free . Given that all people live in society , the desire for individual freedom also becomes a right to collective freedom . Hence the whole community recognized as such, as a group , as a people , as a nation , and of course , as a class , have the inalienable right to decide their future. As expected this September 11th the people of Catalonia will again take the streets to demand something that is obvious and logical : the right to be free to decide as a people on all aspects of our future . This September 11th we are faced with multiple calls to the streets to demand the right to decide . In this regard, we recall that the CGT anarchist union does not just want to be able to choose if it’s Catalan or Spanish leaders who increase massive layoffs and social cuts. We don’t just want the right to decide if it’s Brussels , Madrid or Barcelona who will govern us by decree. 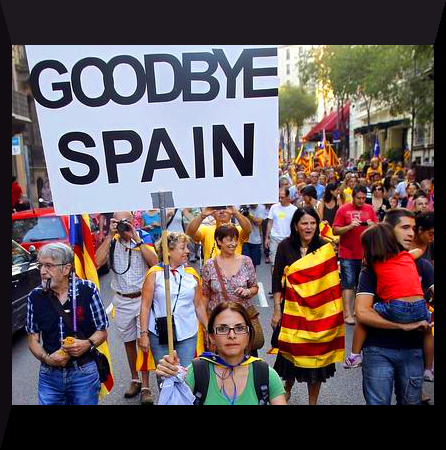 The CGT does not want an independent Catalonia that continues like now , where there are 873,000 people unemployed , with 50% of young people unemployed and forced to emigrate to find work , with tens of thousands of malnourished children. We do not want a country where every day working conditions are cut even more, where Rights achieved through many years of struggle are removed by Decree, while the Public Administration continues transferring thousands of millions of euros to support the banks and pay debt interest . We also reject that dissent is being repressed, while police abuse is concealed, as well as abuse in prisons , and the impunity of the powerful is reinforced, extending and endlessly delaying Corruption Court cases such as Palau, Camarga, Noos, Ferrovial, Pretòria, Mercuri, etc. .
From CGT Catalonia we demand these Rights, as part of a process of personal and social emancipation, which, as well as guaranteeing us self-determination and self-management in all areas of life, should generate a culture and pattern of behavior where all aspects of our lives are decided in common . We demand the right to self-determination and self-management , collective and individual and without conditions or threats , a real and unlimited right to decide . We want to be able to decide our future and constantly practice self- determination in our lives . We want the right to decide our own economic, political , social and personal models. We must be allowed to decide in what language we speak and express ourselves, but also allowed to decide what we want as an economic model . One that allows us to decide to rescue people, not banks, the ability to the prioritise the right of access and use of empty property above housing speculation. Rights that allow us to go beyond just another State as we know them, beyond our routine of elections every four years , beyond the show of political professionals, either based in Brussels, Madrid and Barcelona , where most of them do practically nothing . We want to decide on the right to decent housing for quality, universal Public Services. We need to be able to decide on the model of production and employment relations, on the systems of production of wealth and its distribution . Deciding is also about rights to choose over our own bodies, on the type of food free of GMOs, on our leisure, cultural policy and more social rights . For all these reasons , many of us, female and male, will taken to the streets this September 11th. We will demonstrate in different ways and places, but sharing a common will. The Right to self-determination that we demand, as part of the Catalan people , is not just the fact of deciding what relationship we have with the Spanish State. It’s more than that. We’re facing towards building a free future of solidarity and without capitalist exploitation or oppression of any state . We were born to be free , and we want to be . Catalans will form a human chain along the 400 km seashore of Spain’s Catalonia region under the leadership of non governmental organization the Catalan National Assembly (ANC) with the theme “Catalan way to independence” on September 11, the Catalonian national day. The event aims to both menace Madrid and make Catalan’s voice heard in the world. ANC officials told reporters that they were working to construct the Catalonian government and stressed that as Catalans they had reached their redline on the issue. “We can bear no more. Catalans want a referendum as soon as possible for the foundation of their own state,” the officials said. Vice President of the ANC Jaume Marfany stated that the event on September 11 will be a “peaceful rally” where they will demand their independence to show their democratic and pluralist demands and to announce that they want to become a new, independent European country. ANC officials also reminded that the head of the Catalonia autonomous government, Arthur Mas, had sent a letter to Spanish Prime Minister Mariano Rajoy in July to which there had been no reponse. The letter offered 5 separate models were offered to hold a legal referendum in 2014. He noted that if the 2014 referendum were blocked, they would try for new solutions. 86 Catalan municipalities and 30,000 volunteers will participate in the human chain. The biggest one will be organized in the city of Barcelona. 1.5 million participants, 20% of Catalan population, are expected to join the movement. The catenation activity will also take place in world famous touristic cites such as the Sacred Family Church and Nou Camp Stadium. Similar human chains will organized in 55 cities around the world between September 1-11 to support an independent Catalonia. Why Catalans want their own State. Historically Catalonia had a charter of some freedoms under central Spanish control. Under the fascist era these were lost and the Catalan language banned, only to rebound stronger than ever under ‘democracy’. Recently a new charter the Estatut was negotiated with Madrid but the central government reneged on it when the rightwing took power, using anti Catalan racist hysteria to gain votes and power. With the economic collapse that ‘blame the Catalans’ tactic has increased, along with much heavier cutbacks, even though we pay higher taxes and receive less back than any other part of Spain. The final straw perhaps is the plan to abolish education in Catalan. Those wanting independence have grown from 10 or 20% to a huge majority, even though large sections of people are economic migrants from the south of Spain. The anarchist viewpoint is quite divided, given the obvious evils of nation states and the record of the corrupt catalan business and politicians. 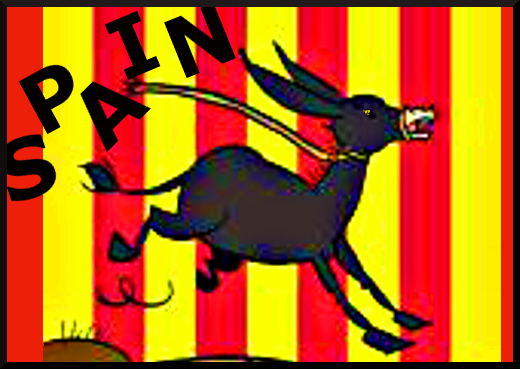 Posted on September 8, 2013, in Europe and tagged Catalonia, Nationalism, Spain. Bookmark the permalink. 1 Comment. Can anyone clarify what is meant by a plan to abolish education in catalunya? I cannot find any info on this online. Thank you.